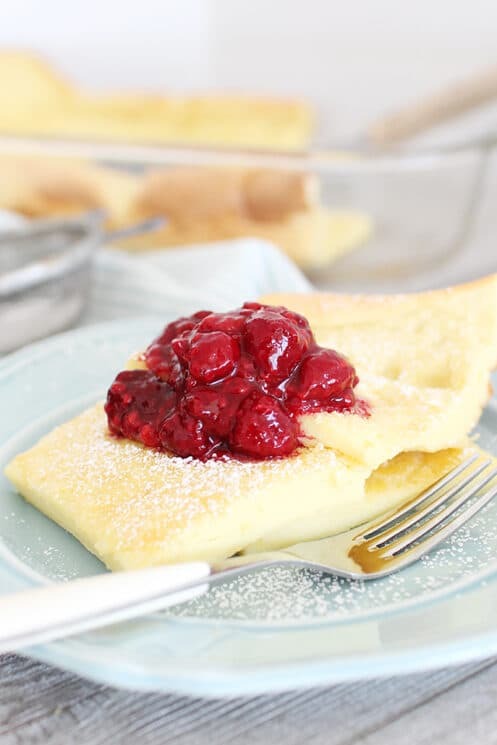 Light and fluffy German Pancakes make a delicious family breakfast that are quick enough for a weekday breakfast or can be fancied up for a special occasion! We started making German Pancakes for our kids on their birthdays. 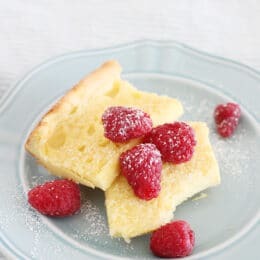 They are fluffy, buttery and so delicious that our kids looked forward to eating them for their special birthday breakfast. Once we made them enough, we started realizing that they were so quick to make that we could make them pretty much anytime with little effort. We love that these pancakes include a lot of eggs because the extra protein makes them a lot more substantial than a regular pancake. If we make these on a school morning, our kids definitely stay full until lunch! 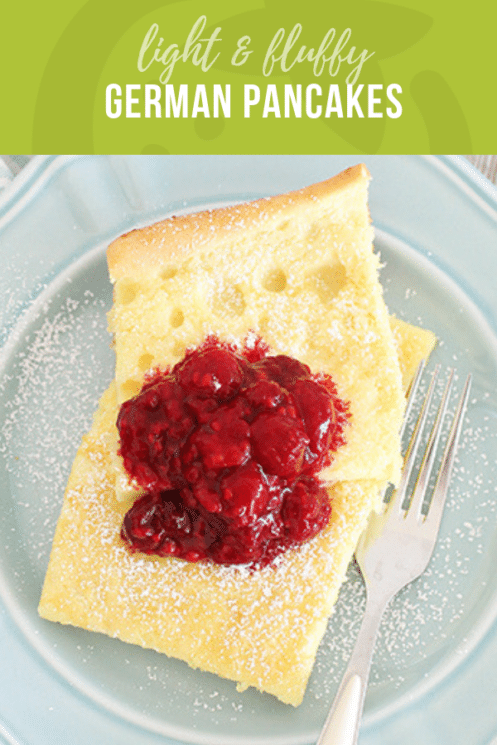 And because they feel more substantial, German pancakes are a great breakfast recipe that you can make for those ‘breakfast for dinner’ nights! Mix your batter in a blender because it makes a perfectly smooth and easy to pour batter, with less dishes to clean later. Make sure the milk, eggs and butter are at room temperature. Make your batter ahead of time for the puffiest, tallest pancake. Place batter in an airtight container and refrigerate overnight. Let it sit out while your oven preheats and your pan heats up. 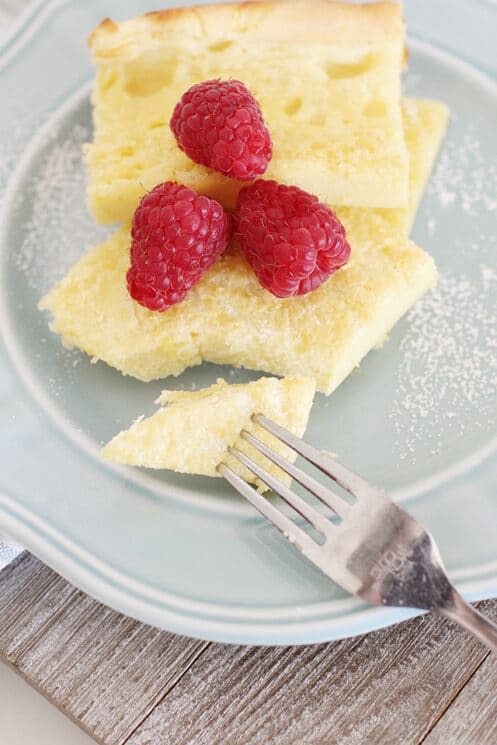 Preheat oven to 425 degrees F. Add butter to a 9×13-inch baking dish; place in the oven to melt. Meanwhile, add milk, eggs, flour and salt to blender. Blend until smooth. Just as butter has completely melted, remove pan from oven. Carefully pour batter into baking dish. Bake for 20-30 minutes or until pancakes have set in the center and the edges become puffy and golden. While pancakes bake, warm berries in a small pan over medium heat. Serve pancakes topped with berries and sprinkled with powdered sugar. I have used whole wheat flour in place of white and it makes it much more of a substantial breakfast plus adds more flavour (more dense, less fluffy though too). Thanks for the recipe, these look delicious and easy to make. Is there any sugar in the pancakes? It is mentioned in step 2 but I don’t see it in the ingredients. Hi! There was a mistake in the recipe. No sugar and it has been changed to reflect it. Enjoy your German Pancakes. In step 2, it mentions adding sugar – is this correct? Thanks! Hi Kim, the recipe had been adjusted a few days back so if you printed or saved it in the old format, be sure to check the recipe again. There isn’t sugar in this German Pancake recipe. Enjoy! interesting recipe. i just wonder about this „german pancakes“ of which ive never heard before – and i am german! r u sure, this is the right name? Hi! 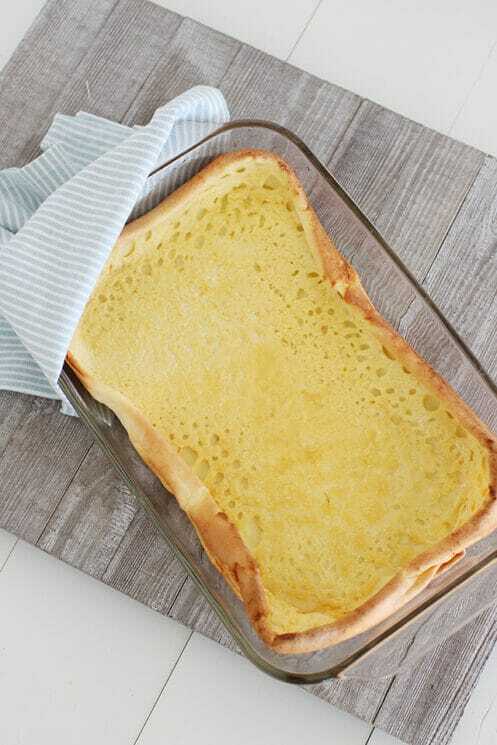 This type of recipe is sometimes referred to as a Dutch Baby, but are definitely also called German Pancakes.